I’ve always thought of myself as quite organised. I plan holidays a ridiculous amount in advance and am good at meeting deadlines. Despite this, for a lot of my working life I’ve had this feeling of overwhelm. Like there was always so much more to do hanging over me, and I could never quite catch up. I’d go from tackling one urgent priority to another and if a task wasn’t clamouring for my attention then it would pretty much get neglected until it too required urgent action. I can’t remember where I first heard the term “firefighting” to coin this state but it really stuck with me as being a very apt way to sum up how I was feeling. And it seemed like I’d never be able to get my blazes under control. If you’ve ever read about productivity tips, you may have come across the “Urgent vs Important” matrix, also known as the “Eisenhower Matrix”. Although this makes perfect sense in theory, I just couldn’t get my head around it. All my tasks went into the Urgent and Important square. I quickly decided this wasn’t for me. Now, however, it makes so much more sense. But I think I needed to get away from firefighting before I could benefit from this approach. Once you get to the point where you actually feel in control of your to do list, rather than it controlling you, it’s AMAZING. It’s what’s finally allowed me to do sensible things like set (and meet) financial targets or work on my side projects. Obviously I’m still human and very much still have a to do list; the main thing that’s changed is how stressed I feel about that list. You might be expecting me to talk about meditation and mindfulness now. Nope! I’m very noisy and fidgety and so get in a bit of a strop when I have to sit still and be quiet. Yes, basically like a small child. As a side note, I do still really want to be more mindful so feel free to share any tips that have helped you, as it feels like it could be beneficial. I’ve just not found a way that works for me yet. No, my focus took a different form. In fact, there were three specific steps that I took. The first step was writing what I called my “June List”. I was feeling – as usual – like I wasn’t in control, and was worrying that I was going to start letting people down (and this is my worst fear so it’s quite motivating). I wrote it a week before the end of the month, with one key difference compared to every other time I’ve written out all my tasks. This time, rather than just listing the to do items, I asked myself “Which tasks, if completed by the end of June, would lead to me feeling more in control and happy”? Why was this alternative way of looking at my tasks more effective? Well for starters, it made me get clear on what was actually stressing me out. It wasn’t the mega-urgent-deadline-looming tasks. It was the ones that, if ignored, could have a negative impact on my client relationships. It was the ones that made me feel like I’d miss out on opportunities if they were to sit, languishing on my list for another month. It also ended up being quite a short list, much to my surprise. It turns out that, although I felt like the whole building was ablaze, I could actually get this fire under control fairly easily. Remember, these were just the tasks that if completed would allow me to finish the month feeling under control. So to be clear, there were still lots of other tasks on my larger to do list! Finally, it made me take an approach that I always advocate but sometimes forget to implement, and that’s figuring out the next action needed for a task. Pioneered by David Allen in his book Getting Things Done, the idea is that if you aren’t clear on the next steps for a task, it can become a reason for not moving forward with it. If I'm remembering rightly, the example he uses is servicing a car. You could have “Service car” on your list and it may seem like a legitimate task. But could you actually do it? Like, if you had a spare few hours, could you go outside and service the car yourself? For most of us the answer would be no, so servicing the car isn’t actually an achievable action in and of itself. What you probably need to do is find the number for the local garage, call to book in a service and then take the car to the garage. So the next action is either “Call the garage” or “Find the number for the garage”. On my digital to do list, I’d fallen into this trap and had “Work on Client X website”. The problem was that I wasn’t clear on what that work was; in fact for most of those tasks I wasn’t able to do any more work as I was awaiting a response from the client. I’d previously requested the information but then never chased them up for it, so for my June List, these tasks became “Follow up with Client X”. Literally, a task that would take less than a minute in most cases, but would help to jump-start a stalled project. Without sending those emails, I’d still have been aware of these projects not moving forward and it would definitely have been contributing to that nagging feeling of not being on top of everything. Sending them meant that I knew I’d done as much as I could and that the ball was now firmly in the client’s court. I’m a really digital person but even I went for paper and pen for this exercise. The second step was choosing my three most important tasks for the day (and doing them). Notice that I didn’t say “the three most urgent”. What I’ve come to realise is that I will basically always do the urgent tasks, because they have to get done. So I don’t need to focus on these; I’ll complete them by default. If I only focused on the urgent tasks, then the ones that could really make a difference to my business (the important ones) would get overlooked. There are several productivity approaches that use this method of prioritising tasks based on their importance. “Big Rocks First” uses the analogy of adding rocks, pebbles sand and water into a jug. If you start with the sand, water and pebbles, there isn't enough room left for the big rocks. However, if you start with the big rocks followed by the pebbles, the sand and water then fit in around them. The big rocks are like the actual important tasks that really make a difference to your business (or your life). The pebbles are, for example, admin tasks that need to be done. Checking social media is the sand, and water is like, Netflix. You can choose to either do your "big rocks" tasks before all the others, or to schedule in time during your day to work on them. Be very careful if you're choosing the second option that you actually honour this time you've set aside, and don't let it get all filled with sand! His strategy is getting the most difficult task out of the way first; interestingly, some of my important tasks are also a bit scary or difficult. For example, I hate hate hate promoting myself. I’m fortunate that all my client work comes via word of mouth, so I don’t need to actively market my web design services. However, I also provide Squarespace training and coaching, and for that I know that I need to reach out to a wider audience. But I still feel really awkward even scheduling a tweet about a workshop! So that would definitely be a frog to eat. MIT (in this context) stands for Most Important Tasks. I can't seem to find where the idea originated, but Leo Babauta talks about it and he's very wise, so that's a good place to start if you want to learn a bit more. In its most basic form, you identify between one and three tasks that you are committing to completing each day. As with the big rocks, these are actions that help to make a real difference or bring you closer to an important goal. I used my June List as a source of tasks to plan out my most important tasks for each day. There were ten tasks on my list, and I had five days available before the end of the month. So I spread them out with two tasks from the June List on each day, leaving one “slot” spare for other priorities. 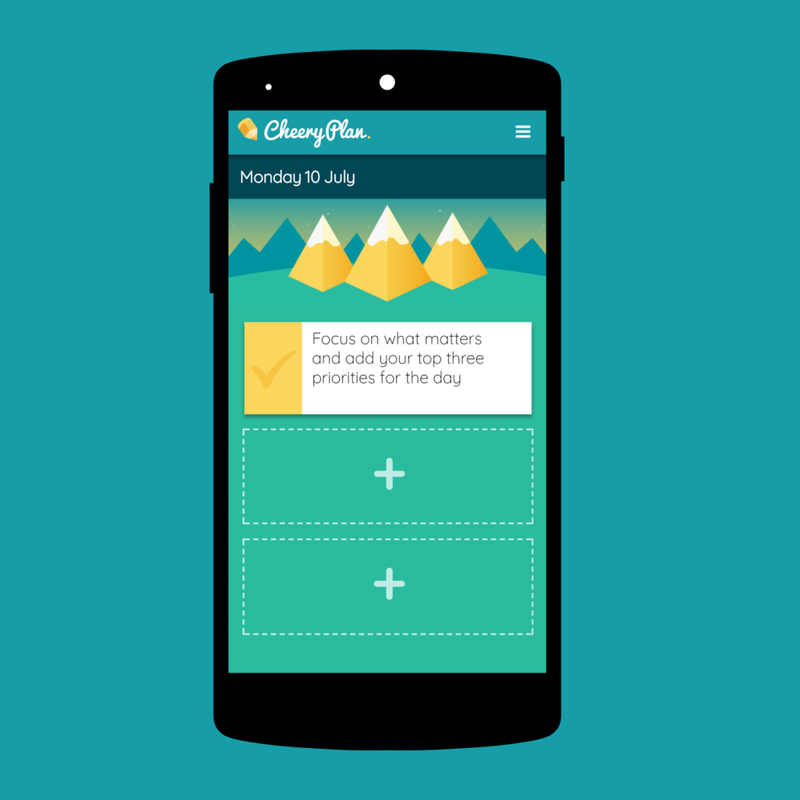 You can write down your daily priorities however you want, but being the digital person that I am, I used an app called CheeryPlan which is designed specifically for this purpose. Full disclosure: I have been involved with the creation of this app so am biased, but I would only ever be including it if it actually worked for me. By focusing on just three tasks for each day, it made everything seem less overwhelming. I originally planned to start the day with these tasks (using the Eat That Frog approach) but that didn’t really seem to work for me as I try to schedule client meetings in the mornings so it wasn’t very practical. I did, however, make sure that I’d done all three by the end of the day. Once you’ve ticked off three tasks per day for a few days in a row, you then get onto a bit of a roll and you don't want to break the chain. It even made me do icky tasks like checking my credit card balance (finances matter, folks) and I finally updated my website portfolio for the first time since 2015. What about the third step? My June List was all about clearing a path to a better state of mind, and it was so effective that I wanted to keep it up for subsequent months. Because there’d been a backlog of important tasks, writing the original list was quite easy, but I wanted to get to the point where I was tackling important tasks before they became urgent. Hey, remember the Eisenhower Matrix? I’ve spoken before about how valuable I find coaching sessions with Michelle from Dive Deeper Development, and I realised that it would help me a lot to sit down with her and get really clear on my priorities. This would then inform the focus for my July List, and get me to a place where I was being much more proactive than reactive, particularly in relation to growing my business. We looked at my medium to long term goals and then worked backwards to clear next action steps. As much as I love client work, I don’t want to take on staff and so need to think of alternative ways to grow. I was also looking for ways to create more predictable income. I almost wrote “passive income” there out of habit as it’s something that you hear about so often in the freelancing world. However, I quite dislike this term as it gives a false sense of the actual work involved. A few people have suggested that I create more online courses around Squarespace, the idea being that I create the course content once and then sit back, watching the money roll in. Whilst I’m sure the online course market is a very lucrative space, I’m also acutely aware that it takes a LONG TIME to put together good quality content, especially if it’s a practical guide which requires me to actually make the website in order to include screenshots and video guides. Once the content has been created, I also need to market it, which takes time. And because Squarespace are so great at regularly updating what they offer, the content that I create would quickly go out of date, requiring me to re-record those sections of the video, which in turn may even need me to recreate at least that part of the demo website. I’d also want to ensure that I was engaging with the learners, especially if there was a space for comments or a Facebook group, and I’d want to implement changes based on any feedback from students who had taken my course. None of this sounds especially passive to me! Yes, there are economies of scale, but after my sessions with Michelle, I’ve realised that for me, the time required to create a really good course wouldn’t leave me with enough capacity for all of the other areas of my business that I’m really excited about. Taking the active decision that I’m not going to create a new online course any time soon actually freed up some mental space for me as well, and again contributed to my feeling a bit less overwhelmed. Whilst I didn’t want to go down the online course route, I did still want to provide accessibly-priced training around Squarespace. My ideal way of doing this would be to have a “snapshot” of Squarespace tips and tricks that would be relevant for anybody currently working on their website, but that wouldn’t stay online and require updating after a few months. I realised that the perfect way to do this would be a monthly email update along with a complementary webinar which could be a bit more interactive, with me doing a Squarespace “show and tell” followed by a chance for people to ask questions. Because I loved our beach hut strategy session so much, I met Michelle in one of the cute little (indoor) sheds at Ziferblat in Media City. 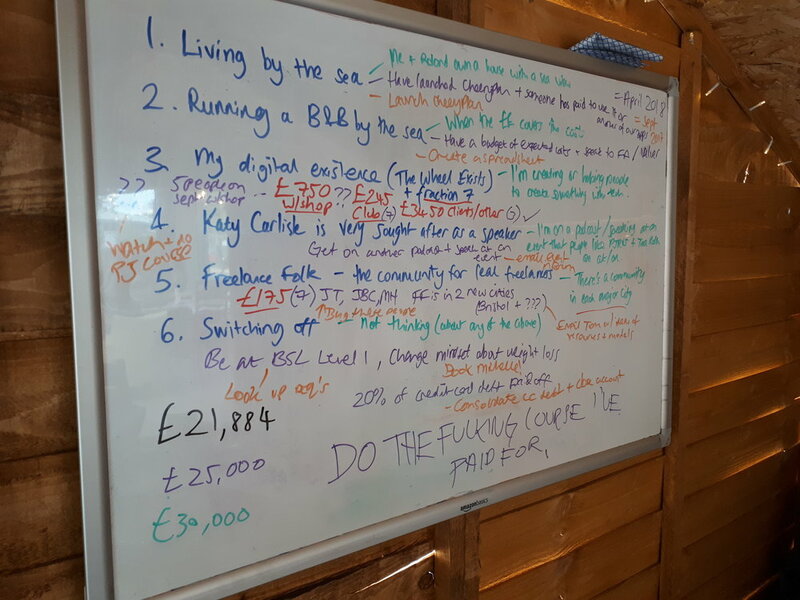 Having the big whiteboard space was great for starting out with my big plans and then getting down to the detail, and Michelle helped me to distill what was important and clarify what success actually meant to me. I have these goals written down in a few places, so whenever I do my planning they're clearly visible. This meant that when I wrote my end of the month focus list for July, I could identify the steps I'd need to take in order to grow these parts of my business. For example, I realised that my website wasn't really set up to showcase my Squarespace support, so one of my priorities was to give it a bit of a restructure. Likewise, I knew that it would be quite hard for anybody to attend one of my workshops if I didn't actually have a date set on my website, so checking venue availability was one of the top items on my July list. It's worth mentioning that I had tried some of these productivity approaches in the past and it was actually combining them which proved to be effective for me. If this combination doesn’t work for you, don’t feel disheartened! Keep experimenting until you find what does. And let me know how it goes or what you struggle with in the comments below. Wondering what the financial figures mean? You might notice above there are some random amounts of money scrawled on the whiteboard in the photo above. I'm just putting the finishing touches to a blog post about how much I earn as a freelancer. If you'd like me to let you know when it's ready, sign up to my newsletter. Thank you! Please check your inbox and confirm your subscription there (just to check that you're a real human and not a nosey robot).